The winter months bring certain property maintenance concerns that all landlords need to be aware of. When the temperatures drop, one major issue that could come up is a frozen water pipe. 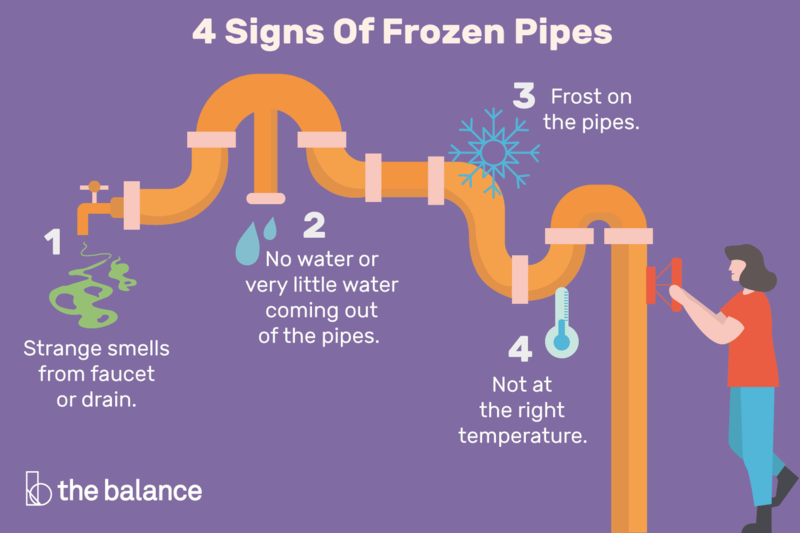 Learn why frozen pipes are so dangerous, the types of pipes that are most vulnerable to freezing, and four signs that a pipe is actually frozen. Frozen pipes are a problem for a couple of reasons. They can create an inconvenience but, more seriously, can cause major damage to your property. Potential to Burst– The second problem that can occur when a pipe freezes is that the pipe actually bursts. Once the actual water in the pipe freezes, pressure is created between the closed faucet and the blockage that can build up to a point that causes the pipe to explode. If the pipe bursts outside, this could also create dangerous slippery conditions while the temperatures are below freezing. Southern Climates– Pipes that are located in climates which rarely see cold temperatures may be particularly vulnerable to freezing. This is due to the lack of insulation around the pipes. Since these areas rarely see temperatures around 32 degrees Fahrenheit, water pipes are more likely to be located in areas of the property which are not properly insulated against the cold. Exterior Walls– Water pipes that are located along the exterior walls of a home can be vulnerable to freezing. This is because they may not have an adequate amount of insulation protecting them from the exterior temperatures. Attics and Basements– Pipes that are located in attics or in basements may also have a greater tendency to freeze. These pipes may not receive the same amount of heat as the rest of the property. If these areas are not used as living space, they also may not be properly insulated. The Temperature Is Right– Pipes cannot freeze if it is not cold enough outside for them to do so. Water does not freeze when it is 60 degrees Fahrenheit outside, and neither do pipes. When the temperature falls to 32 degrees Fahrenheit or lower, you should begin to take precautions to prevent vulnerable pipes from freezing. There Is Frost on the Pipe– For pipes that can actively be seen, such as those under sinks, you may be able to see frost that has accumulated on the exterior of the pipe. This can serve as a warning sign that the pipe is frozen before you ever try to turn on the faucet. No Water Is Coming Out of the Faucet– Another sign that you may have a frozen pipe on your hands is lack of running water. If you or a tenant turn on a kitchen or bathroom faucet and only a slight trickle of water or no water at all comes out, the water pipe leading to the faucet may be frozen. Strange Smells- A fourth potential sign of a blocked pipe is an odd smell coming from a faucet or drain. If the pipe is partially or completely blocked, the only way the odor can escape is back up in the direction of your property. Once you are aware that a pipe is frozen, you must act quickly to thaw the pipe. Depending on the location of the pipe and your level of expertise, you can attempt to thaw the pipe yourself or you can contact a licensed plumber to thaw the pipe for you. It is imperative to thaw the pipe as soon as possible because it has the potential to burst and cause extensive damage to your property. It is very difficult to estimate the cost of fixing a frozen pipe because each situation is so unique. Two factors that play a huge role in cost are the location of the pipe and whether the pipe has burst. If the blockage is buried in a wall, fixing the issue will become more expensive. You may spend a few hundred dollars cutting open sheetrock to find the problem or more than a thousand if you need to hire a plumber to find and thaw out the blockage. If a frozen pipe bursts and you have a flooding issue on your hands, you could be faced with thousands of dollars of damage. You will have to hire a plumber to fix the burst pipe and then you will have to deal with fixing any damage the water has caused inside your property. If you have the proper insurance, they should help cover some of these costs. You need to call your insurance agent to determine the specific details of your policy. Some policies have specific requirements you must follow in order to be covered, such as maintaining the heat at a certain temperature in your home or shutting off the water supply during absence from your home to prevent a potential flooding issue. An insurance company wants to see that you took reasonable measures to prevent a problem from occurring. Some policies may cover the pipe repair but not the flood damage that it may have caused to your carpets or possessions. Others may cover the reverse circumstances: Even if your policy does cover damage caused by a burst water pipe, most policies do not cover the cost of replacing the actual section of damaged pipe. Therefore, you will still have to come out of pocket to fix the pipe yourself or hire someone to do so. Insurance may cover the cost of repairing the wall around the damaged pipe.